Remove the front bumper fascia energy absorber. Refer to Front Bumper Energy Absorber Replacement. 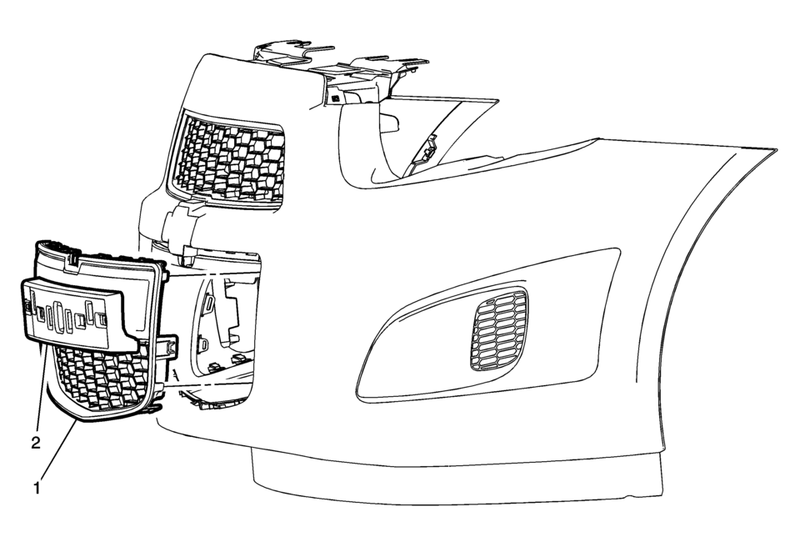 Release the four upper tabs from the front bumper fascia. Release the two outer center tabs from the front bumper fascia. Release the four lower tabs from the front bumper fascia. Push the lower grille assembly outward, from the front bumper fascia in order to remove. Upon installation, index the right center alignment pin to the front bumper fascia first, followed by the ten locking tabs on the lower grille assembly to the front bumper fascia. Push the locking tabs inward at all ten locations, in order to secure the radiator lower front grille to the front bumper fascia. Remove the four screws and the front license plate bracket to transfer to the new lower front grille assembly, (if equipped).